In today's trending, the latest social media trend shows off slim figures, man eats noodles calmly in face of violent gang fight, a tortoise falls out of the sky, and a teahouse is set up in the middle of a tree. Can you touch your bellybutton around your waist? The selfie generation is not shy about showing off their figures online, and the latest trend on Chinese social media has spawned thousands of photographs doing just that. "Reach your belly button from behind to show you have a good figure" is the latest hashtag to show off your body, and many women and men have posted photos of themselves doing so. Experienced body trainers say the new trend is about flexibility of the arm and the size of the waist, rather than fitness. A lean person with fewer muscles has a better chance of achieving the pose. Thousands of Internet users posted their successful or unsuccessful photos of the challenge. Most of those who made it are obviously thin and long limbed, but there are also exceptions. 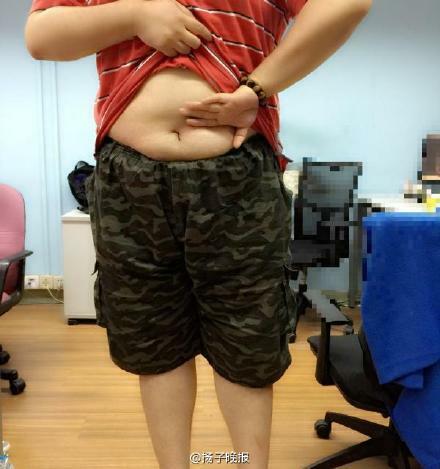 A man's picture showing him in the pose became a sensation online, as he has a perfectly round beer belly but still succeeded in reaching his bellybutton around his waist.